Review by AllTheBestFights.com: 2018-04-14, exciting and tough fight thanks to a great performance by both fighters: Dustin Poirier vs Justin Gaethje is one of the best mma fights of 2018 and it gets four stars (UFC Fight of the Night). The black belt in Brazilian jiu-jitsu Dustin Poirier entered this fight with a pro mma record of 22-5-0 (77% finishing rate) and he is ranked as the No.5 lightweight in the world. He was defeated by Michael Johnson in 2016 (Poirier vs Johnson) but then he beat Jim Miller (Miller vs Poirier) and Anthony Pettis in 2017 (Dustin Poirier vs Anthony Pettis); between these two bouts he faced also current #1 Lw Eddie Alvarez but the bout ended in a no-contest since Alvarez landed illegal knees (Alvarez vs Poirier). His opponent, the former Wsof Lw champion Justin Gaethje, has a record of 18-1-0 (89% finishing rate) and he entered as the No.8 in the same weight class but he comes off his first loss, suffered against Eddie Alvarez (Eddie Alvarez vs Justin Gaethje); before this bout, in 2017, he had won over Michael Johnson (Mma Fight of the year 2017 candidate, Johnson vs Gaethje). 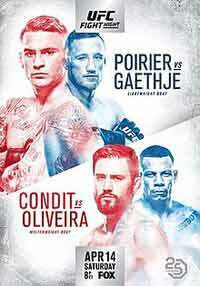 Poirier vs Gaethje is the main event of UFC on Fox 29. Watch the video and rate this fight!